Imagine my surprise at walking into Zuma, our local coffee shop in downtown Marshall, and finding a middle-aged black guy playing electric guitar and singing Chicago Blues. But there he was, Al “Coffee” McDaniel, and not only was he singing and playing the Blues, but he was doing it really, really well. The man has got the gift. This latest addition to the Madison County music scene is to be a regular Monday night affair at Zuma and yet another feather in owner Joel Friedman’s cap. Friedman has been hosting the very popular Thursday night Bluegrass jam with the legendary fiddler, Bobby Hicks, for the last few years, but Blues Jam represents a significant departure from Madison County’s musical norm. As most of us who live here, and many people who don’t, understand, Madison County is steeped in musical tradition – balladry, old-time, country, and bluegrass – and is considered a “source” community by music scholars for those genres. Recently though, with the arrival of hundreds of new people to the community including numerous first class musicians from other musical genres, our melodious parameters have been expanding. One of those musicians is the noted, and widely respected jazz keyboardist Steve Davidowski who is the mover and shaker behind the Monday Blues Jam. Davidowski is known in music circles as an early member of the Dixie Dregs, a jazz, southern rock, bluegrass, and classical fusion band based in Athens, Georgia. Since moving to Marshall, he has graced the town with his impromptu piano playing, walks around town with piccolo in hand, and his wonderful yearly benefit concerts for Neighbors in Need. 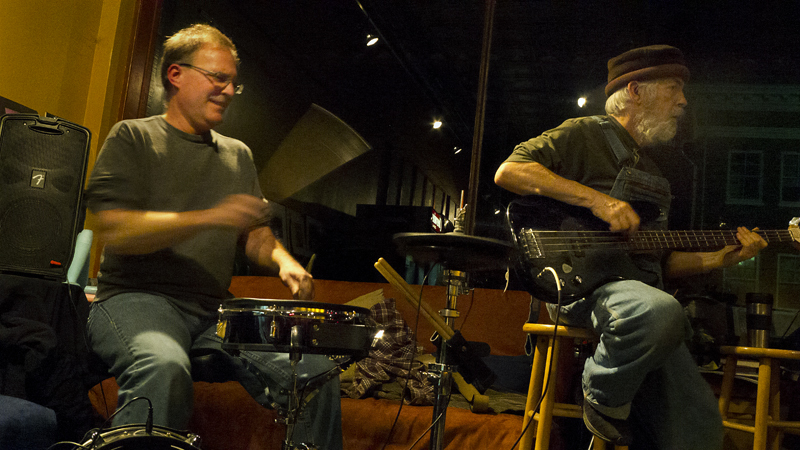 This past Monday, in addition to McDaniel, he was joined by John Herman on bass, James Wilson on drums, and John Hupertz on harmonica. Local singing sensation, Ashley Heath, also sat in and did a full throttle version of Stormy Monday. With this new sound in town, Marshall residents can be assured that Mondays will not be stormy, and Tuesdays won’t be bad either. 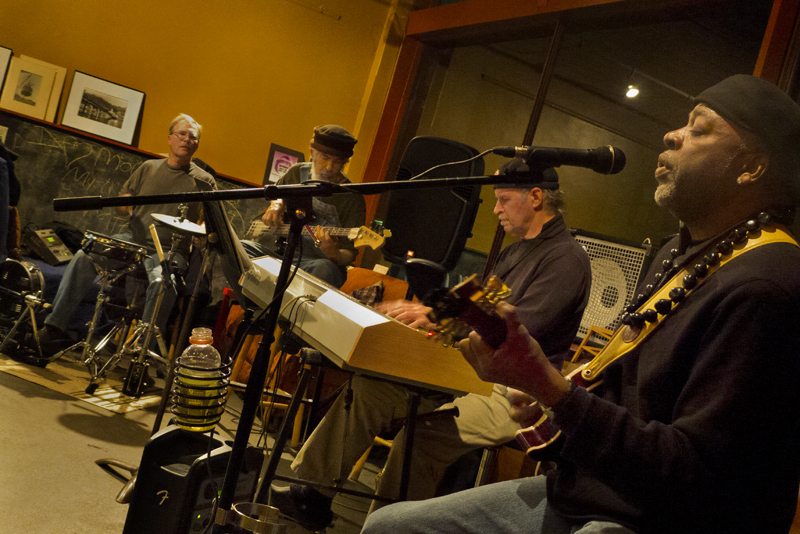 Top, Blues Jam at Zuma Coffee with, from left James Wilson, John Herman, Steve Davidowski, and Al McDaniel. Middle, Ashley Heath singing Stormy Monday with McDaniel, Steve Davidowski on sax, John Hupertz on harp. Bottom, James Wilson on drums, John Herman on bass.